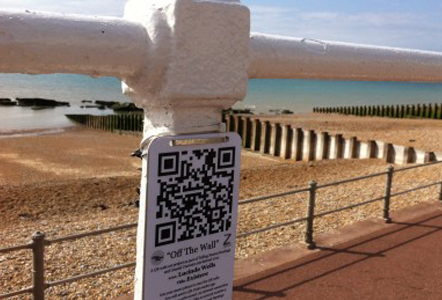 The ‘Off The Wall’ QR Code project was seen around Hastings and St.Leonards in August/ September 2012. 14 plaques were placed around the town, one for each of the artists featured in the ‘Telling Stories’ exhibition curated by Cathryn Kemp. We were approached by Cathryn and invited to come up with a street based marketing campaign for her exhibition at Hastings Museum, We suggested giving each artist a unique QR code linking to a webpage. 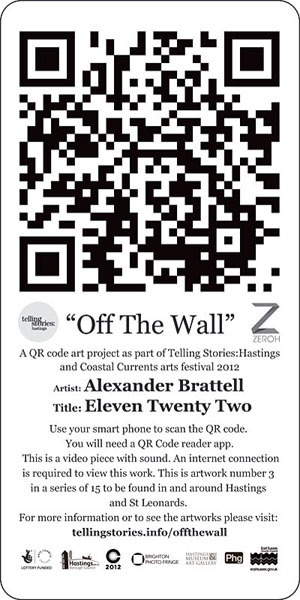 We encouraged the artists to create a new site specific work to take full advantage of the nature of QR codes and asked them to choose a location within Hastings to respond to.